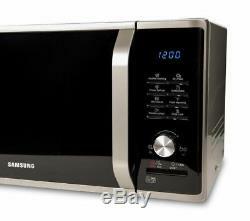 SAMSUNG MS28J5215AS Solo Microwave - Silver - Currys. 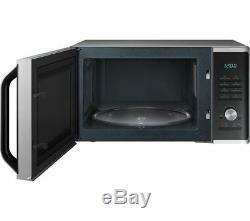 Small Appliances > Microwaves > Standard microwaves. Top features: - Even heat thanks to the Triple Distribution System - Easy cleaning with a ceramic enamel interior - Stay fresh thanks to the deordorising function - LED display makes it easy to select programs Even heat The Triple Distribution System delivers heat from three different points in the cavity, for effective and even heat whatever you're cooking. Intelligent features also ensure your food is heated perfectly during each of the 22 cook programs, while the Plate Warming Function quickly and evenly warms plates and serving dishes. Easy cleaning Made from durable, anti-bacterial ceramic enamel, the MS28J5215AS is easy to clean and scratch-resistant. There's no need for scrubbing simply wipe down and its smooth surface stays clean and won't discolour over time. Stay fresh Forcing air out for the interior cavity, the Deodorising function gets rid of lingering smells and helps eliminate bad odours to keep your food fresh and delicious. LED display Take the hassle out of cooking thanks to the MS28J5215AS's easy to use LED display. Select from auto cook programs, up to four defrost programs or manually select the ideal time and temperature. 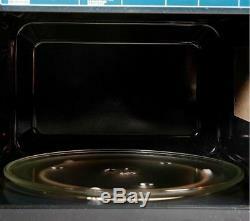 Accessories for your microwave Liven up your microwave cooking with our range of microwave-safe accessories. Whether you need to warm up your soup for lunch or steam rice and vegetables for dinner, you'll find something to help you create exciting meals in your microwave. 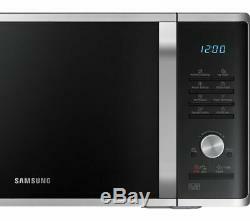 Stylish designed and extremely hard-wearing, add a touch of class to your kitchen with the Samsung MS28J5215AS Solo Microwave. All Currys/PC World Outlet guarantees are non-transferable. 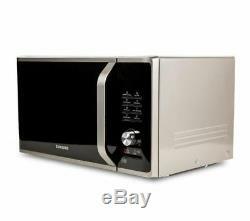 Maximum microwave power: 1000 W. Cooking modes: Defrost, Reheat, Plate warming. 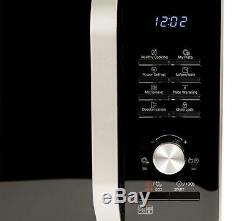 Auto cooking programs: 22 auto cook programs including:, Healthy cooking, My plate, Soften/melt. Auto defrost programs: 4 auto defrost programs including:, Power defrost. Number of power levels: 7. Control panel: Push buttons & dial. Maximum countdown on timer: 99 minutes. Other features: Turntable on/off function, Deodorisation, Eco mode. 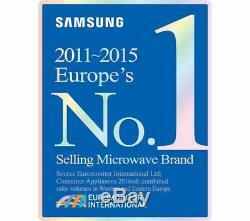 Cord length: 1.1 m.
Box contents: Samsung MS28J5215AS Solo Microwave, Glass turntable, Plate warming bowl. Internal dimensions: 255 x 357 x 357 mm (H x W x D). External dimensions: 297 x 517 x 428 mm (H x W x D). Boxed dimensions: 297 x 517 x 428 mm (H x W x D). This product has no reviews yet, however see what our buyers say about our other products.. Small box electricals like computers, tablets, camera's, small kitchen appliances. We deliver within the UK only. We don't post to Channel Islands or Internationally. Warehouse/store pick-ups are not available. Courier selection is standard and will depend upon value and/or weight/dimensions of the product. Express: DPD - for safe, secure, signed-for deliveries to your door. This includes Northern Ireland and the Isle of Man. Can a Currys or PC World retail store help? Reassuring 12 month guarantee on all products. 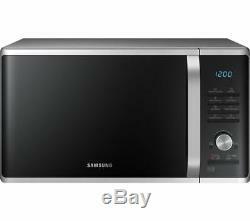 The item "SAMSUNG MS28J5215AS Solo Microwave Silver Currys" is in sale since Friday, July 15, 2016.